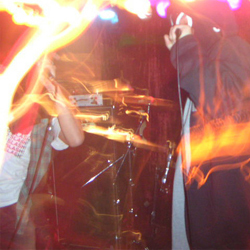 Ultra Fuckers was started in 1991 as the evolution of the Zeni Geva inspired home recording project GODKILL, with Kawai on drums & vocals and Izumi on guitar. UF drew their inspiration from style of Happy Flowers along with noise, junk and psychedelic music. Kawai start SCUM-NITE on Bears in 1992 featureing in the course of 11 years: Boredoms (Dendo-Ba, Inarian Tamasiiner Head, Yama's..), Super-Ball, Tsuyama-Atsushi (from Omoide Hatoba, Acid Mothers Temple), SOLMANIA, RUINS, Surfers Of Romantica, FAXED HEAD, Zip Code Rapists, 25 Suaves, Caroliner Rainbow, ENE, Monotract, Half Japanese and many others.